this is so majestic, i cannot wait to read the backstory!!! What a lovely image and enigmatic words. 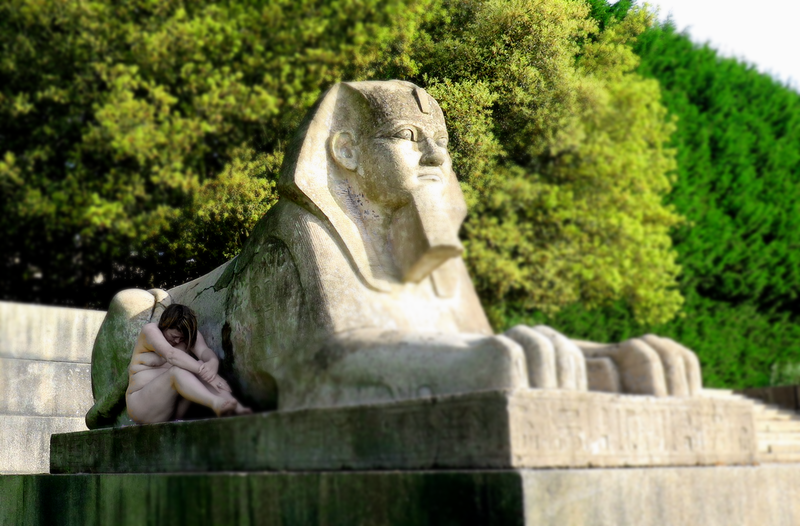 There’s a sphinx in this photo? Wow, that’s an awesome pic!! I LOVE it . . . very brave, and very serene! Oh wow – simply stunning (and very cleverly composed, too). This would also be perfect for the Scavenger Hunt, if you want it? This is am amazing photo! Wow! Amazing shot, and I can’t wait for the story! Such a powerful image. It’s a beautiful sculpture, but if you don’t mind me saying, it seems less significant somehow with you beside it. You take such incredible photos!! I love the poem as the lead in to the photo. And the photo, boy do I love the photo. Your pose, the shadow, the bright leaves on the trees, all of it. Love!